Smoldering in a provocative lip and eye look, the dancer, singer, and actress takes the wheel to lip-sync to Ocean Park Standoff's new single "If You Were Mine." Beauty and music are not intuitive bedfellows in the way that, say, beauty and fashion are. But consider the parallels. A fresh blow out has the same mood-lifting powers as an upbeat pop track. A whiff of certain fragrances brings on the same rush of nostalgia that hearing your favorite song from tenth grade does. And both are uniquely intimate—the lyric that always makes you cry and your most deeply felt physical insecurity are expressions of your most unguarded self. On an essential level, music and beauty perform the same function: they’re transformative, sensory expressions of moods, tastes, regrets, ambitions, longings, and triumphs. And obviously, if you make good decisions, they both make you look really cool. It’s in this spirit that VIOLET GREY is proud to present LIP SYNC, a series of videos that plays with the intersection of both disciplines. The premise is simple: amazing women wear amazing makeup and sing along to amazing new music. That’s it. Consider it the stylized version of what you’ve done in the mirror a million times. And since VIOLET GREY is based in Los Angeles, that mirror happens to frequently be a rearview mirror, as seen in these clips. Music credits for the videos belong to Ocean Park Standoff. 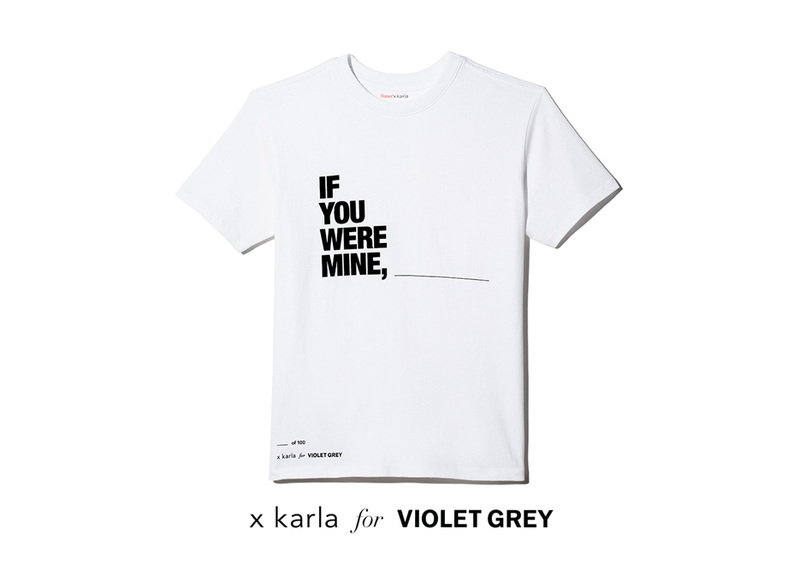 The trio’s “If You Were Mine” not only soundtracks our Lip Sync series, but was also the inspiration for our limited-edition x karla for VIOLET GREY t-shirts. The collaboration pairs Ocean Park Standoff’s provocative conditional with x karla’s perfectly cut, perfectly draped white cotton tees to generate two 100-piece runs: customized and blank. The first is by the band, the second is for you to complete. Shop all the editions here, and then click here to stream “If You Were Mine” by Ocean Park Standoff.